Andrei Markov's future with the Montreal Canadiens is uncertain due to a long injury layoff, while teammate Scott Gomez's struggles defy explanation. It was a sight for sore eyes for Montreal Canadien fans, who have seen their playoff hopes virtually evaporate over the past few weeks. The solitary figure wearing the No. 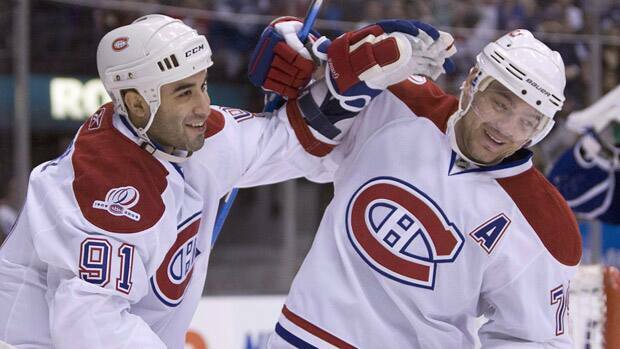 79 was indeed the real deal - Andrei Markov had taken to the ice on the Bell Center. Unfortunately, he was alone last Saturday morning as he went through a set of intricate movements that were videotaped by the team's head athletic therapist as he performed this private type of audition for an exclusive group of two. Canadiens' doctor David Muldar and general manager Pierre Gauthier watched intently from the player's bench. Talking to Gauthier later, he put it in perspective: It isn't a case rehabbing his knee anymore for the Canadien defenceman. It is a case of Markov learning how to "restart ... jumpstart his playing career once again," as Gauthier put it. "The knee has been sound since the first of December but the complications have been with the swelling in other areas," Gauthier told me. They hope to get him in the lineup for about 20 games this season to give him that jumpstart and hopefully have his "engine" back in full working order by next season. Speaking of the Canadiens, I don't think I have every seen a comparable situation like the one with Scott Gomez going a full calendar year without scoring a goal. We are talking about 50 games and to make matters even worse Gomez - who was known more for his playmaking then his goal scoring in previous NHL stops - has only has 17 assists over the past 50 plus games. Even a fourth-liner who plays few minutes, like my colleague P.J. Stock, would still get the odd goal or two along the way. This is just weird. The noise by the crowd at the Bell Center seems to match the oddity of Gomez's dubious "achievement"
It is an unusual murmur sound as he touches the puck or it comes near him. It sounds like some mocking, some derision, yet, also a genuine sense that they are just waiting to burst into a standing ovation when he finally does successfully pull the trigger. I feel like I am watching my eight-year-old son play a house league game and hoping that he can score his first goal of the season. I was wondering last week if NHL sheriff Brendan Shanahan needed a week to prepare for a big Super Bowl party that he was hosting or something like that. I am used to awaiting his videos on supplementary discipline with regards to length of suspensions. Instead it has been a steady diet of $2,500 US fines, the most that a player can be fined under the terms of the Collective Bargaining Agreement, rather than suspensions. And, it has continued this week as well. There seems to be a genuine feeling that Shanahan and the NHL office are now especially leery to directly impact the close playoff races in both conferences. It seems that what might have drawn a game or two as a suspension about a month or so ago, is now a $2,500 fine. Looking at my recent retirement portfolio, I wish had taken the unofficial Gary Bettman financial advice. Fewer RIM stocks in my modest portfolio would have at least seen by "nest egg" rise a bit rather than go backwards. I am one year further away from the possibility of retiring and I don't have a second NHL team in southern Ontario as well. Which Alexander Ovechkin will we see now that he has returned from his three-game suspension and "boycott" of the NHL All-Star weekend? The dominating Ovechkin has been seemingly missing since the 2010 Winter Olympics. To put into perspective his dominance: When Ovechkin score 65 goals in the 2007-2008 season, he was the first NHL player to hit the 60-goal plateau in 12 seasons, following Mario Lemieux in 1995-96. Sam Gagner of the Edmonton Oilers joined us on Hockey Night in Canada Radio the day after his stunning eight-point performance against the Chicago Blackhawks. That tied the Oiler team record for most points in a game with Wayne Gretzky (who did it twice) and Paul Coffey. Both of those legends contacted him to offer their congratulations. When Gagner recorded a point on the first three Oiler goals in their next game against Detroit last Saturday, he set a record of his own with a point in 11 consecutive team goals, one better than Gretzky. Wayne Gretzky told me in an interview years ago that Darryl Sittler's record of 10 points in one game was one that he was always aware of and actively chased, yet it continued to elude him. The eight points in a single game remained Gretzky's personal best. I liked that Sam Gagner was quick to celebrate the moment with his father Dave. Now both are in illustrious company of sharing a record of some form with the Great One. Dave Gagner has four points in one period for a playoff game with the Minnesota North Stars on April 8, 1991, in a game against Chicago. He shares that NHL playoff record with 13 others, a list that includes Maurice "Rocket" Richard, Mario Lemieux (the only NHL player to accomplish this playoff feat twice). And yes, the Great One, Wayne Gretzky.